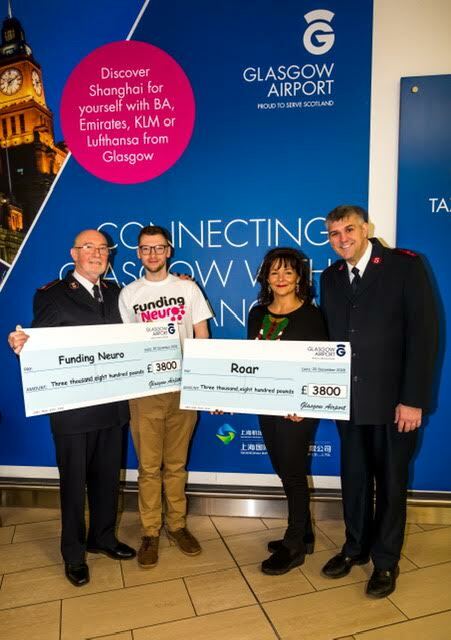 In 2018 Funding Neuro was chosen by the Glasgow Airport Chaplin as one of their charities of the year along with another local charity ‘Roar’ who help with support for the elderly in the local community. The Funding Neuro team would like to thank both Glasgow airport and the Salvation army. In particular Mr Keith Banks and Mr Stephen Baker for all their wonderful help. Over the last year they allowed access to the airport for collections and public outreach. This was a tremendous success, letting us reach a greater number of people and spread our message. We wish Keith, his team and Glasgow airport all the best in 2019.